Some might think reviewing the 1966 adaptation of How the Grinch Stole Christmas is a fool’s errand. It has been a staple of the holiday season since its original airing, grasping the great Dr. Seuss’s visual style, humor, and simple-but-effective message. It has Boris Karloff voicing the Grinch, is produced by animation legend Chuck Jones, and is over in less than 30 minutes. What more could you want? The story follows the Grinch (voiced by Boris Karloff), a mean, green creature who lives above Whoville. Every year, the Whos celebrate Christmas in full force, bringing out decorations, toys, and, to the Grinch’s dismay, all the noise, noise noise noise. Fed up, he decides to rob the Whos blind so they can feel pain (and keep the racket down to boot). He suits up, rides down Mount Crumpit, and begins the greatest caper the world has ever known. How the Grinch Stole Christmas is hard to honestly criticize. While some of the dialogue doesn’t match up with the mouth movements and some animation is repeated, I don’t want to appear as a Grinch myself, and recognize that most people couldn’t care less about these issues. It looks and feels like Dr. Seuss, has good slapstick, and moves briskly. Would I have liked to know how the Whos felt about the Grinch, or a better reason for his hatred of them? Absolutely, but that’s why we have remakes. 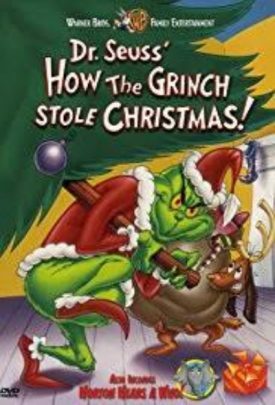 While I personally prefer the live-action version for adding some roast beast on the story’s bones, this special perfectly translates the look and feel its source, and only a true Grinch could fault it for that. See it.